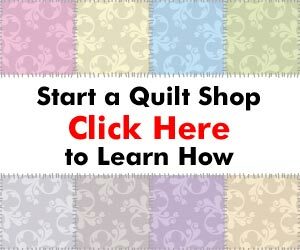 Reader Question: I’ve stalled a little bit with starting my own quilting business…. It starts to get hard to think of all the things that need to be done, and it seems very overwhelming and intimidating not to mention expensive. I want to have a nice little “family” business to expand on my love of quilting. My husband is very handy in that he could do a much of any “remodeling” that needs to be done with regard to fixtures and such. Do you have any insight for me. I want to continue to pursue this but obviously need a little more information. This ebook is $37 and you get so much included with that-besides the main ebook, there is also sample business plans, resources for supplies, how to figure out your initial inventory needed, fabric-calculator, etc. is it VERY comprehensive, and will probably help you a lot in terms of figuring out a plan and if this is right for you.